Known to people across the world by different names, this iconic vehicle will always be remembered in the annals of automobile history. To some its the Samba, to others a Kleinbus (Germany), the Pão-de-Forma (loaf of bread) in Portugal, Rugbrød (Rye bread) in Denmark, Hippie-van in USA, Volksie in South Africa, Danfo in Nigeria ...... this quintessential icon will always remain a Bulli (also known as Bully) to the world. Whatever the nick-names the easiest way to classify them are by the words ‘Early Bay’ or T2a (for models produced before 1971) and ‘Late Bay’ or T2b (for models made after 1971). Bands from the Beatles to Pink Floyd and Led Zeppelin used them. People painted them in different shades and hues signifying hippie culture. However one that clearly stood out was the Bully that was seen at the Woodstock Music Festival in 1969 (Pandit Ravi Shankar played the sitar here along with tabla maestro Ustad Alla Rakha). This VW van painted by Robert Hieronimus in 1968 for Bob Grimm of the band Light drove to the festival along with fellow band members. A diecast model maker also made a replica of this bus on the eve of Woodstock’s 40th anniversary. This scale model in size 1:12 is now a treasure among collectors worldwide since only few were made. In the 1940’s, a Dutchman called Bernardus Marinus who was famous by his nick name Ben Pon managed a business called ‘Pon’s Automobielhandel’ that sold German products such as Continental tyres and Opel cars. And this association with German brands, made him travel to Germany quite often. He also wanted to distribute the Volkswagen Käfer (Beetle) as it was popular then. So he visited the Volkswagen Wolfsburg plant in February 1947. The factory then was being managed by the British since Germany had just lost the war and Britain was overseeing the country. By April, he could convince the British authorities and their Management to become the official importer for Volkswagen in Netherlands. So he placed his first order in April itself. By December he had already sold over 50 Beetles in Netherlands. During his several visits to the VW plant, he noticed that workers inside the factory were using an improvised carriage that would carry spares and small machineries between various plants within the premises. Upon inquiring further he learnt it was a simple carriage that used the same Beetle engine. Workers called it a ‘plattenwagen’ (steel plate wagon) as it consisted of a single large plate that was placed on top of an improvised carriage. The driver used to sit at the back, just above the engine and steer the vehicle with goods in the front. It struck him that he can make use of such vehicle to transport both men and materials. Europe was then badly affected by war and a small machine that would carry load would be viable, if done correctly. Immediately he sat down to make a sketch in his diary and drew a figure. His sketch put the driver in the front with material at the back within a steel box shaped vehicle. He also made several notes on the next page that mentioned that an empty vehicle should weigh 750 kg and when loaded should also be able to carry additional 750 kg. He submitted his drawing to the management of Volkswagen. This was April 1947 when he placed his first order for the Beetle. And the story of the Bull (T1) was seeded. A former Opel hand Heinz Heinrich Nordhoff who was by now managing Volkswagen (1949) along with his Technical Director saw commercial viability as most of the parts would be borrowed from the Beetle (designated as Type 1). He got four different prototypes made for further approval. The first prototype was fabricated in less than 3 months but for some reason would not work and failed during wind tunnel testing. So the next one was built with parts borrowed from one of VW models called Kübelwagen. Finally a new model called Type 2 having split V-windshield offered better results in wind tunnel tests with lesser Cdw (average aerodynamic drag). It was lesser than the smaller Beetle. Nordhoff immediately gives approval to the factory to start production in May. On 12th November 1949 the first vehicle rolls out with a 1131 cc air-cooled engine having 25 hp. The birth of the Transporter (first generation of this Type 2 is called T1) takes place and a new category of vehicles is born in automobile history. This one is nicknamed Bulli and gets launched at the Geneva Auto Show. 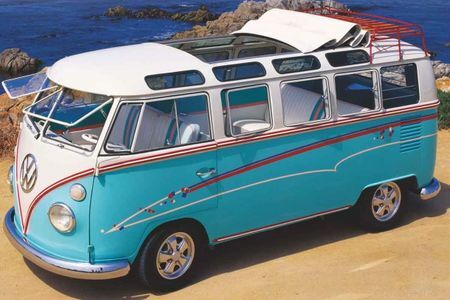 In the beginning the Kombi (nickname for small bus) with side windows and seats was offered along with the commercial version (van). After six months several new variants rolled out such as ambulance, pick-up, etc. Production gears up and Volkswagen starts rolling out 10 vehicles every day. The engines are so reliable that customers were driving them even after completion of 200,000 kms a record by itself given the frugal technology that went into its making. For the next 17 years the T1 (or the first generation Type 2) gets manufactured. And this was just the beginning. The second generation Type 2 or T2 appears in 1967 with a single windshield and more heavier than the T1. These are made until 1979 when it was felt to come up with a better version. The T3 (or the third generation Type 2) makes its appearance in the spring of 1979 with a completely new design, having larger volume space and also much heavier. By 1990 production of these transporters surpasses the 6 million (60 lakh) mark. The T3 is made until 1992. So much was its success that while the T3 were being produced, Volkswagen had already developed the fourth generation Type 2 (T4) in 1990. The new design was completely different from all her predecessors. It was a complete breath of fresh air that her designers gave. The engine that was all these years at the rear, was moved to the front and with several payload options depending on user needs. These get made until 2003. The T5 (or the fifth generation Type 2) debuts in the year 2003 with a 2 litre turbo-diesel engine with several high end options. For the next 12 years these gets produced and there is no shortage of demand prompting the VW management to give the world the latest.